Wait, nothing new? Nothing at all? I don’t even have a Blu-Ray player and yet I was tempted to go buy this in ANTICIPATION of getting one, and to vote with my dollars in order to let Disney know that this movie is worthwhile. It has the DVDs of the original and the sequel. Blu-Ray is HD, so the colors stand out more and the quality is better than the DVD. But there are sadly no new features. 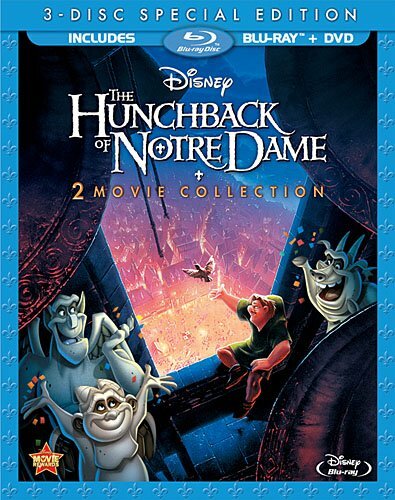 I purchased it, hoping for new features and because I have a Blu-Ray player and it’s one of my favorite Disney films. My take is that if you’re looking to buy it, hoping for new features and don’t care about the HD quality, then stick with the DVD. But if you’re a fan and are as happy for this release as I am…or if you want to see the film in HD quality, wait a few weeks and I’m sure the price will come down. But for those two reasons, buy it. Yeah, I pre-ordered mine on Amazon, expecting something new. Nope, nothing new. It is somewhat disappointing, but when you think about how much time/effort Disney put into marketing it I’m not surprised. Peter Pan came out a couple weeks ago and there were plenty of commercials for it’s Blu-Ray release. I didn’t see any commercials announcing the HOND Blu-Ray release. Hopefully in 3yrs, when HOND hits the 20yr anniversary (I was 10 when it came out in theaters…now I feel old) Disney will give it all the fanfare that their other films receive. It seems each generation has its “dark” Disney film…the film that has a large underground following but is not marketable and seems to be the one that Disney doesn’t regularly release. My mom’s generation had The Black Cauldron, the ’80’s had Tron and those of us who grew up in the ’90’s have HOND.